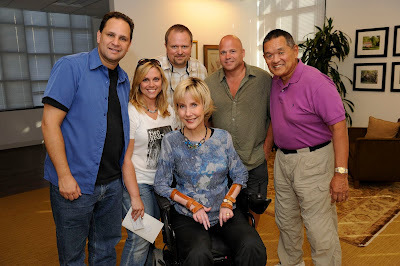 My co-workers and I with Joni and Ken. Last week, when I was in California with my team from work, to cover the GOP Presidential Debate, I had a great opportunity to see some really special friends, the folks at Joni and Friends, including Joni and Ken. 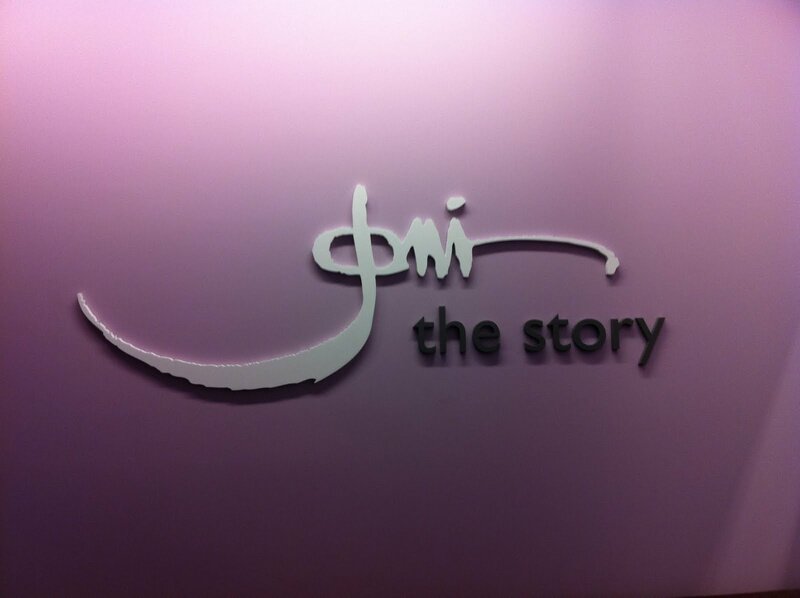 I have shared with you before the impact Joni's ministry has had on me, and about the time Michael and I got to have lunch with Joni and Ken a few months ago. What an honor! I figured, since I was in the neigborhood, we could stop by for a tour of the Joni and Friends International Disability Center. So thankful to Judy and Ken for showing us around! This is the chapel. It's right at the heart of the building, and the ONLY way in is up a ramp! Very symbolic! The walls display a lot of Joni's artwork. 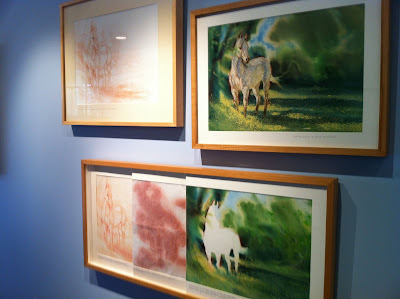 This shows the progression of a painting from the beginning. Months of work! 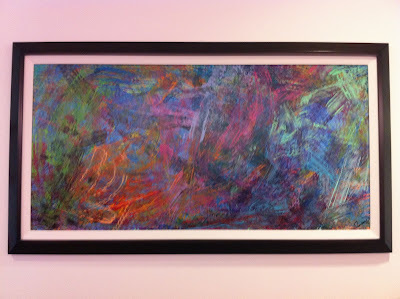 This one was a gift from Joni to her dad. 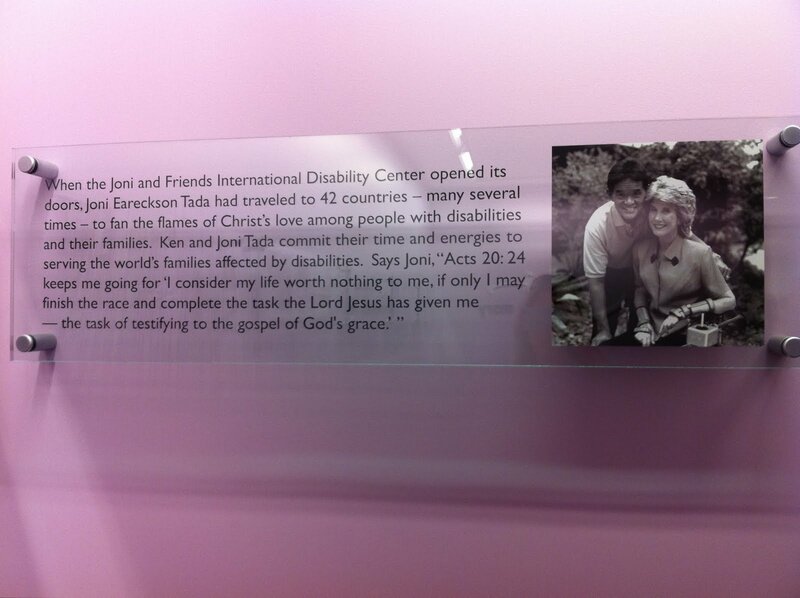 Another couple of walls are dedicated to telling Joni's story. I always love the pictures of Joni and Ken together. They always look so happy and in love. A man sent this to Joni and Friends as a gift. 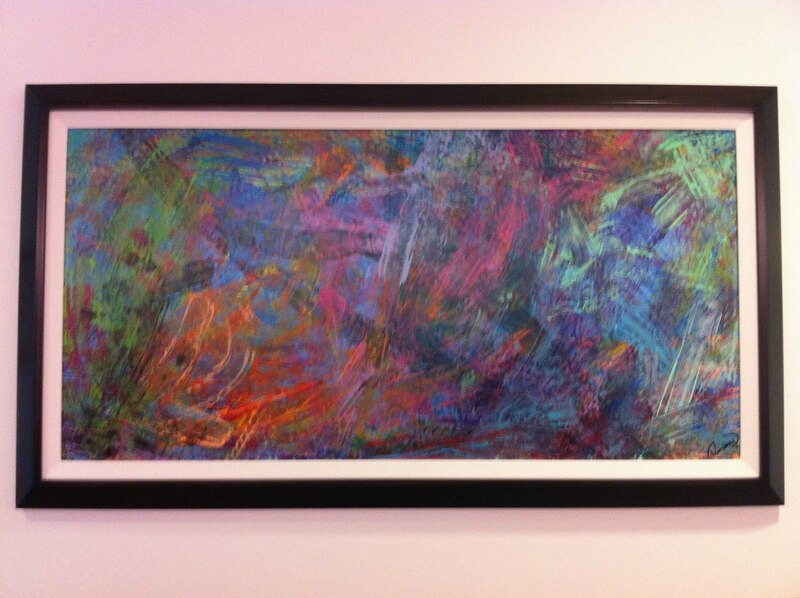 He painted it by rolling his wheelchair around in paints, then rolling over the canvas. If you look closely, you can see paw prints from his dog "helping out." Of course, I totally thought of our household. 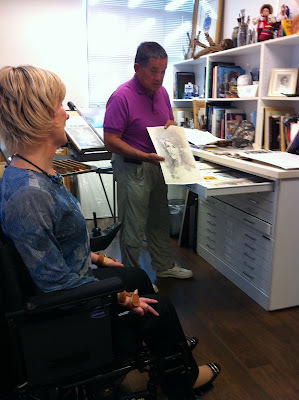 The biggest treat of all was when we met Joni, and she and Ken gave us a tour of her office, and her art studio! Ken is showing us a drawing that one of Joni's friends did after her accident that shows her "putting the pieces back together." 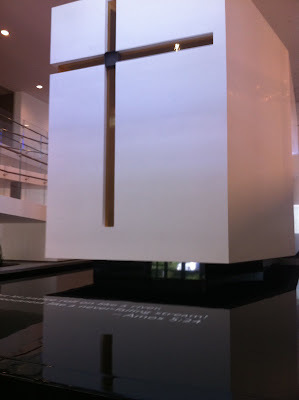 But, as Joni explained it to us, some of those pieces never fit back together perfectly, and there is great wisdom in trusting God for those pieces that don't go back the way they were. I can so relate to that! 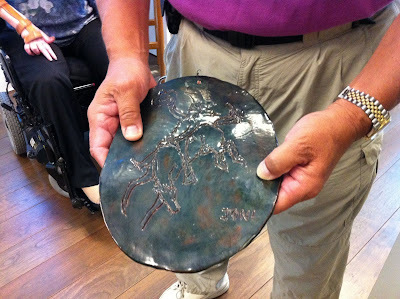 Ken held this plate up for us, and Joni told us that this was the first etching she did after her injury, and how important it was for her to see that her talent was coming from the inside and that it still oozed out, even though her hands didn't work. So amazing. I love that. My heart was so lifted when I left. And I know my co-workers were blessed as well. 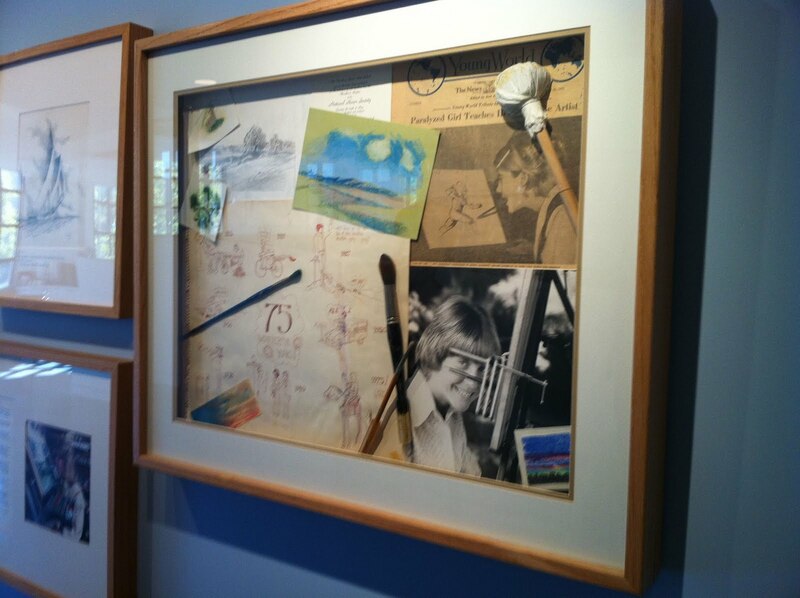 I am so thankful for Judy, Joni and Ken and everyone at Joni and Friends for the work that they do to help people with disabilities and their families all over the world. 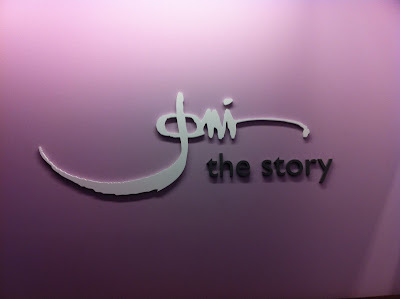 Joni even posted about our little visit on her blog! Can't wait to see them again! Next time, hopefully, Michael will be along for the ride! I spent last weekend at Ridgecrest with the Singles Labor Day Event and co-taught with my precious friend Lori McNeil who, like Joni & Michael, "rolls through life" after a car accident in 1993. One of the sweetest, most Christ-like people I've ever known. I believe with all my heart God has a special place and plan for those we so often label "disabled" . . . and if the truth were known, the majority of those in this world who are indeed "disabled" are rarely those in wheelchairs . . . I so agree with you about how happy and in love they always seem. And springboarding off that and what Diane said above--they have in each other what so many who aren't "disabled" never ever ever find. But seriously, how wonderful God's provided this connection for you. He is good. I also love the story about the "pieces" *sniff sniff*. In my own way, I relate as well. I think we all can. I can't wait to meet her next week here in Ohio. Jimmy and I are going to the Bioethics Conference at Cedarville. Maybe you should come cover that as a story - then I can meet you too! :)I saw that she mentioned you and I was grinning - "She is my Facebook friend!!" What a great visit! So glad you got to go (and I am now over my jealousy:) )!